← Global Freshwater Seed Accelerator Spotlight: Vegetal i.D. The Global Freshwater Seed Accelerator Spotlight series has concluded with the recent Spotlight interview featuring Vegetal i.D. The Water Council will now shift gears, and conduct Feature interviews with the rest of the tenants located within the Global Water Center. First up is Jeanne Berlin of EnvolUs, the American operations of French company, Envolure. Welcome Jeanne, please tell our audience your title and briefly describe what work you do at EnvolUs. My title is Transfer Engineer, because my role is to transfer EnvolUs’ technology to our customers. It’s not something that you can just sell, and leave a manual for them to do on their own, you actually have to go through the technology process with them a few times, to ensure they understand how to use the technology. I am in the process of setting up the company, the lab, finding partners, understanding the market, and when we identify customers that want to establish a permanent operation, beyond the pilot-scale; I will go there and transfer our technology to them. I was hired by Envolure specifically to setup a United States operation, I was an employee of Envolure for a few months to understand the full scope of the business, I still go back to France every six months. The purpose of coming to the US was the larger market, but also there is an entrepreneurial spirit here that doesn’t quite exist in Europe. People here are curious about innovative technologies, and if you have a good idea, they will help you to nurture it, and get it off the ground. Can you speak a bit on your background? I studied in France, attended an Engineering school and received a degree in Bio-Sciences Engineering; which is a general term that entails micro-biology, bio-chemistry, and bioinformatics; before that, I was also an exchange student during high school, and resided in Missouri for a year. Have you always been interested in wastewater treatment, or more generally, the water industry, how did you make that connection? I didn’t know about it until I was looking for a job, I didn’t really hear about it until then, most of the students in my class pursued research in Genomics, or imaging and computer science. When I found this opportunity, what I liked was I would be doing something I enjoy, research, applied to water and environment which are fields that I find very motivating. Tell me more about what EnvolUs does, and the technology that you will be transferring to clients? The founders of Envolure were academic researchers in France, studying the biodegradability of organic matter via bacteria, and they realized that little innovation had been done in the field of environmental analysis. 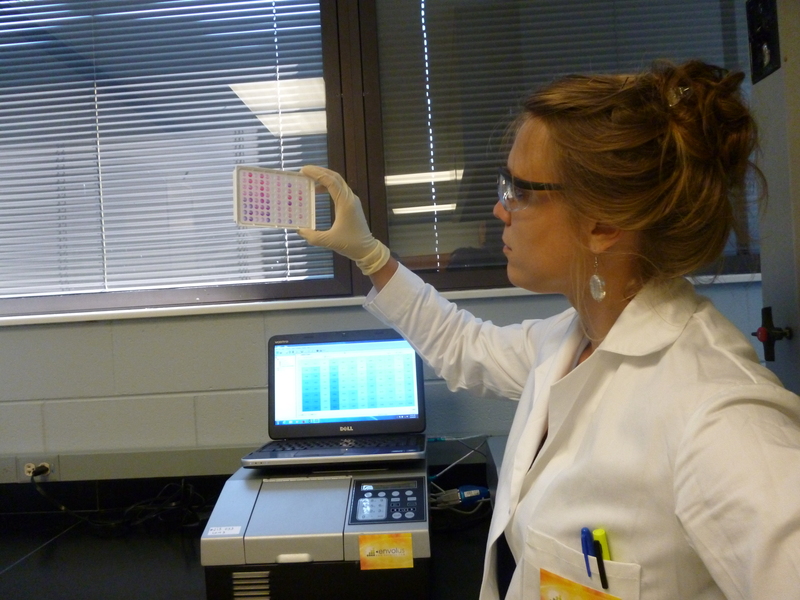 They adapted a technique well-known in the biomedical field; the microplate format with fluorescence reading, and applied it to the environmental field. Based on this idea, they have been able to develop a variety of innovative analytical tools for monitoring bioprocesses faster, better and with less space and resources. 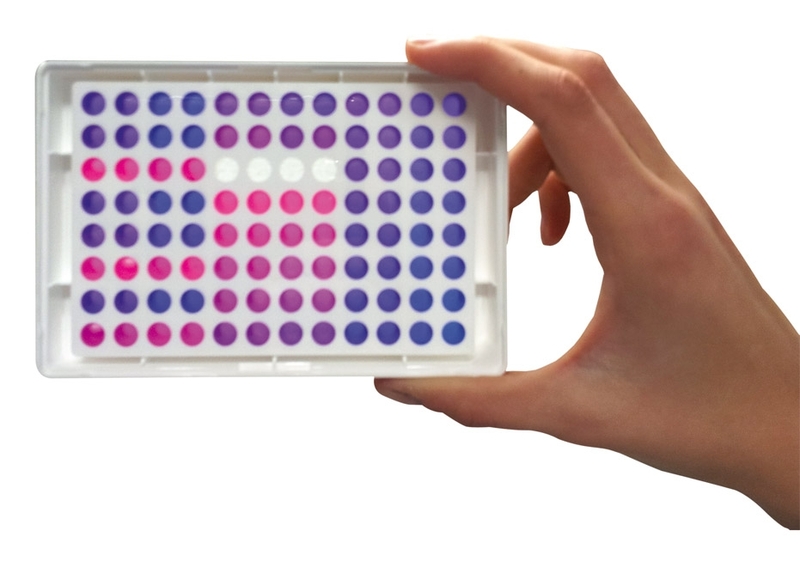 Microplate, each well is capable of running analyses normally carried out in 300-750ML bottles. For example, our lead product Enverdi measures BOD5, or biochemical oxygen demand in five days. Currently, in a regular lab, they use a single 60ML-300ML bottle for each analysis conducted, whereas in one microplate, we can perform 40 analyses at a time. You can imagine the significant difference in space consumption when using our trays as opposed to using 40 large bottles for the same set of analyses. We have also reduced the time it takes to conduct the BOD5 analysis from the original 5 day timeframe, to 2 days. The BOD5 analysis measures the biodegradable fraction of the organic load in a wastewater sample, or how much of the matter is degraded by bacteria in the sample in five days. It is mostly measured in wastewater treatment plants as an indication of how clean the water is, once it leaves the plant. The 5 day process is a hundred years old, and it goes back to when the analysis was developed in London. Five days is the amount of time it took the water to travel from London to the sea. Nowadays there is no real significance to that timeframe, it’s just the established norm. It’s difficult to convince people to adopt our more efficient, faster technology because they have gathered so much data using the old process, and they are familiar with the original method. Also, we have to get our technology approved by the EPA so that our customers can use our method for reporting. 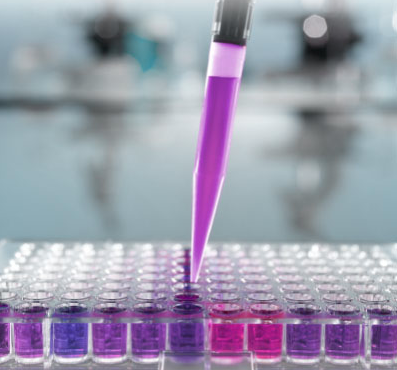 The idea is to design different analyses that you can perform with the same reader and the same format, you just have to learn how to do it for each, using different reagents. So far our lead products are the fast BOD5 test and the fast BMP test, which is the Biochemical Methane Potential, where you predict the amount of biogas you’re going to get out of one substrate, or one type of waste, that you put in an anaerobic digester. How are you convincing people that this is a better, more efficient technology than what is currently the normal standard? I have a lab space at Milwaukee Metropolitan Sewage District’s central laboratory, that’s where I spend most of my time. I am doing a pilot study, where I test samples from MMSD’s wastewater treatment plants and I compare my results with theirs. I think the advantages of the technology are fairly easy to understand, the main thing is to convince customers that it’s working. It takes less time to get your results, less space and less time to set-up the system. What has been the initial response from potential clients, is it something that they believe they will be able to adopt in their own practices? There is definitely an interest and curiosity, but they are still doubtful, they want to see evidence that it works, so that is what I am doing with Milwaukee Metropolitan Sewage District, I am gathering data and comparing their BOD5 analysis with mine, and building a graph to show that it’s within the required range. You are the one that established EnvolUs as an American Operation, what has that experience been like so far? It’s been challenging, but also rewarding being so young and entrusted to execute the daily operations and develop the company. I have learned so much because I’ve had to do things that I had never heard of, specifically the business aspects, while I was in school studying, so it was a learning process. Part of the challenge was understanding the way business works in America, obviously, it’s different than the business culture that exists in France. Also, dealing with the French side of the company and the US side, because each entity wants different things, and it becomes a balancing act, trying to satisfy both parties. As a foreign company, trying to establish a US operation, did you sense any type of pushback initially, or did you feel embraced and welcome early on? What goals or milestones have you set forth or accomplished thus far? The first goal was to set-up the lab, and make sure that the product was working as well here, as it was in France. When you change labs, if you change one minute detail that you don’t even think about, it could ultimately effect your results, and give the wrong outcome you were expecting. I am still validating that step and ensuring it is working just as well here. Once the product is working properly the next step will be to recruit customers and help them adopt EnvolUs’ technology. Another milestone will be receiving approval from the US EPA, once we are approved then we will have access to a larger, different market available to us, and that will be a huge validation of our technology. Do you have any parting thoughts that you’d like to leave us with? I think that the work taking place here in Milwaukee is helping to put it on the map globally as a hub of water technology, before I became involved with The Water Council, I didn’t know about Milwaukee. Now when I go home, I can tell people I’ve been working in Milwaukee, and show them where it is and all the great things happening here, this movement is only going to grow bigger as time goes on. Aside | This entry was posted in Global Water Center, Water Accelerator Center and tagged EnvolUs, Global Freshwater Seed Accelerator, Global Water Center, Milwaukee Metropolitan Sewage District, Milwaukee Water, The Water council, Waste Water Analysis, Waste Water Treatment, water. Bookmark the permalink.